Today’s Blogmas topic was inspiration, which is something I’ve always struggled with. I’ve always viewed the creative process as this mutant power that I just don’t have like being able to teleport. I’m good at technical writing but just being able to sit down and bang out a paragraph has never been my forte. Really, that’s been my inspiration for blogging this time around – to try and be able to just sit down and let the words pour out. Whenever I’ve tried before, I’ve constantly edited myself and tried to make everything perfect, I’d spend an hour running through thesauruses (thesaurii?) to make my turn of phrase perfect. I read something on Fat Mum Slim recently about blogging that really resonated and inspired me to try again – she writes just like she speaks’. I found that to be my problem, when I write I have an obsessive desire for perfection because someone might see it so I edit and polish until I have a beautiful gem – that no-one will ever see because I never think it’s good enough. It’s a vicious cycle. My goal is to change that and let imperfection inspire me, because life isn’t made in the perfect moments, it’s made in the bits that happen in between. So this is me. Throwing it out there for everyone to read, warts and all. Exactly! I’ve learned to carry a notebook with me now because sometimes I just can’t type fast enough. 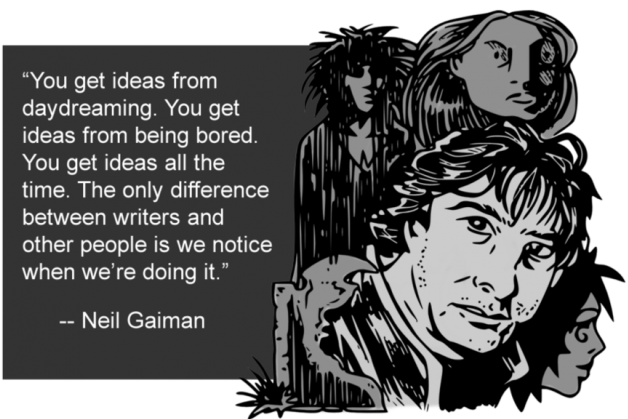 Love this post and love the quotes you’ve included – it’s so true that we draw inspiration out of everything and writers possess such a skill to realise it and draw from it constantly. While I like to consider myself a writer, I find most of the time I think too hard about inspiration that I let so much past me. But now with getting more and more into blogging, I’m definitely drawing from all inspiration which provides even more inspiration all the time! Love your post, can really relate to the quotes.